DRIVERS are being encouraged to buy electric cars with a new package which guarantees they will be powered by 100 per cent green electricity. Scottish Power, which announced last month it was selling the last of its gas-fired power stations to generate all its electricity from wind power, has linked up with car dealers Arnold Clark to offer motorists a special renewable energy tariff along with the UK’s smallest home fast-charging point when they buy an electric vehicle. Only two per cent of British adults currently own an electric car. But a survey commissioned to coincide with the launch of the new tariff found one in five said they would consider buying an electric car within the next three years. Scottish Power said the fast charging point could power up a Nissan Leaf with a 40kWh battery in seven hours compared with 15 hours if a standard plug socket was used. And the package will include an app which will allow vehicle charging to be remotely scheduled via a smart phone so owners can take advantage of cheaper off-peak rates. ScottishPower CEO Keith Anderson said: “We have moved on from fossil fuels to concentrate on clean renewables and now we are announcing the UK’s first end to end electric vehicle package that is 100 per cent green. After removing carbon from how we generate electricity we believe the decarbonisation of the UK’s transport system has to be next. “This means industry and government working together to build the infrastructure so we can charge electric vehicles as well as building clean and cheap renewables to bring down the cost of motoring. 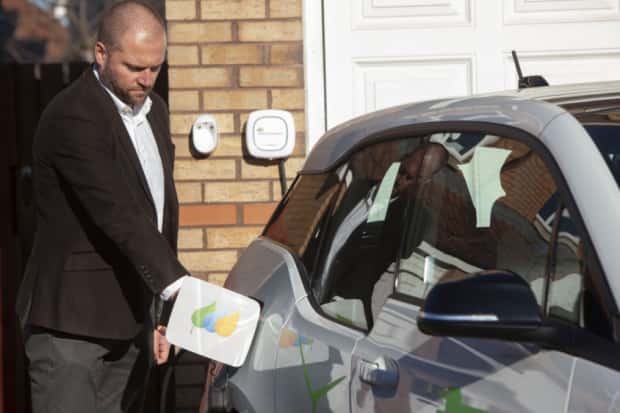 Drivers buying or leasing an electric vehicle from Arnold Clark will now be able to book a home charging point installation and sign up to the 100 per cent renewable electricity tariff as part of one package. The poll found a third of those who do not currently own an electric vehicle would be more likely to consider one if there was a guarantee the power would come from 100 per cent renewable sources. Mr Anderson said: “We’re accelerating the switch to electric vehicles by giving customers everything they need to make the change hassle-free. The home charging point is priced at £899, but Scottish Power said grants were available which could reduce the cost to as little as £99. Scottish Power said the annual cost of electricity to charge a Nissan Leaf for 6,000 miles of motoring would be an estimated £194 compared with £627 a year for petrol for a similar sized hatchback, a Vauxhall Astra 1.4i turbo or a yearly fuel bill for a diesel Vauxhall Astra 1.6CDTi doing the same mileage. A motorist with a Tesla Model S could expect to pay £467 a year for electricity to cover 12,000 miles, while someone with a BMW 540i x-Drive would face a petrol bill of £1,506 and diesel for a BMW 530d x-Drive would cost £1,161. The city council agreed last month to press ahead with a £3.3 million investment in over 200 new electric vehicle charging points at strategic hubs across the Capital.